Swingers is a Crazy Golf course and venue near to Liverpool Street, opening on 25th September. Created in a warehouse space in Hearn Street that has played host to many events, including Junipalooza earlier this year, Swingers will also feature a 1920s style clubhouse, perfect for relaxing in, with a cocktail bar, plus food from famous names like When Mac Met Cheese, Patty & Bun, and Pizza Pilgrims. Booking is already open - see details below. 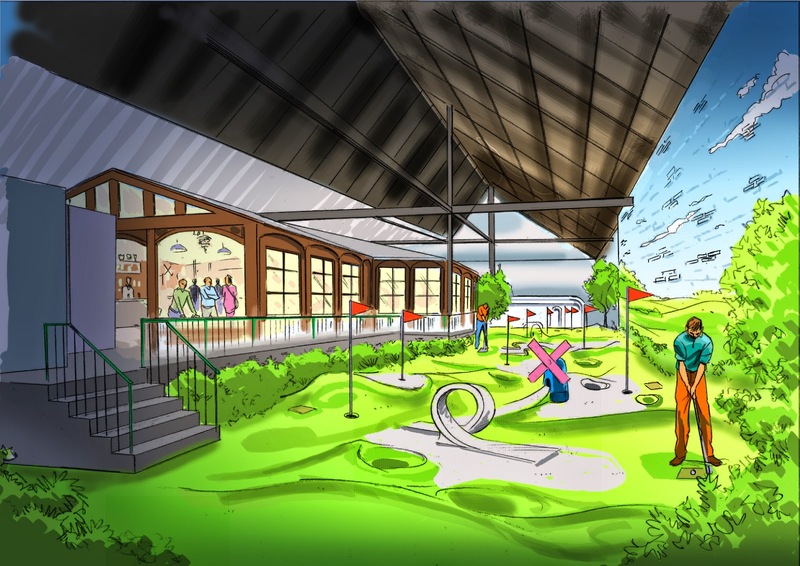 "Swingers will transform an impressive 7000-sq/ft warehouse into an amazing destination to host London’s new golfing experience and take competitive socialising to a new level. When you enter the Swingers world, you'll be hit with a fully immersive experience. A 9 hole crazy-golf course (crafted by the finest minds in crazy golf), 1920’s clubhouse bar and terrace and a street food diner serving award winning food courtesy of some of London’s hottest food offerings. All of this will be accompanied by a curated soundtrack. You’ll run the full gamut of golfing emotions while playing on the course. Competitive crazy-golfing is well known for being one of the highest exertion sports, so you’re going to need some serious athlete food to be on top of your game. Perched high on a bluff above the course will be the authentic 1920’s clubhouse. This will be Shoreditch’s only golf bar, and the walls will be lined with the trophies of sporting glories past. Head to the Clubhouse to start your mental and physical preparations for the game. Or just kick back and soak up the atmosphere with a drink in hand. With a full cocktail bar, dance floor and sound system, the ‘Royal Shoreditch Clubhouse’ is going to be the perfect place to spend an evening socializing and hopefully celebrate sporting success. The Swingers team will be launching with a three-week residency from the one and only burger phenomenon Patty and Bun. Time Out's only 5* Burger restaurant, Patty and Bun will be serving up their famous Ari Gold - Organic Beef patty, Cheese, Lettuce, Tomato, Pickled onions, Ketchup, homemade Smokey P&B mayo, Brioche. Pizza Pilgrims will also take up a residency for the launch period. They'll be serving their legendary Neapolitan classic pizzas from their infamous Pizza wagon on Berwick Street. their delicious sough dough base pizza's will be served with a choice of toppings - Marinara - San Marzano Tomato, Garlic, Oregano and the Nduja Spicy Sausage - San Marzano Tomato, Parmesan, Fior di Latte, Nduja spicy sausage and Basil. This original concept will be delivered with flair and style. Think ‘Great Gatsby’ meets ‘The Legend of Bagger Vance’ with a little twist of ‘Bugsy Malone’. Whatever your view of golf, this destination venue has everything you need for a brilliant, competitive and exciting night out."